We always want to develop quicker, and if it were possible, we’d prefer to overcome the whole path in one leap. However, when a person understands that what is being revealed to him is perfection, he concentrates on his state and realizes that he has to reveal the perfection particularly in this state, even if it is the worst possible state. It is possible that he’ll reveal a connection with the Creator precisely in that state. Therefore, we have no reason to dash ahead to other states. This is usually a problem for beginners. They think they need to reach great changes somewhere far ahead. But that’s not the case. We always exist in the state of Infinity, and how we reveal the connection between us and the Creator depends on our current attitude to reality. Therefore, a person’s journey can either be long or short, depending on what he concentrates on. You can reveal perfection in your current state, and then you’ll see that you are already in it. All you need to do is clear the concealment and reveal the Creator, who is everywhere. Then you and He are in unity. This is very important since we always think that the spiritual worlds and degrees are somewhere far away, and we don’t know what we are striving for exactly. However, this isn’t so. One advances in the right direction if he is enjoying the adhesion and revelation in his current state. After all, a person reveals the Creator in this life, within this world, through his connection with other souls. He does it by connecting with a book in front of him, a TV program, or the Internet. Everything is right in front of us. We don’t need to run anywhere – in material or spiritual space. All of this space is only inside the depth of the present state. If we don’t forget this, our path will become short and simple. A question I received: If a person is happy and proud of the fact that he is controlled from Above, then where is the bestowal in this? My Answer: The bestowal lies in the fact that the person reveals the Upper Governance. We don’t do anything except reveal this. Our whole work consists of revealing the system of the universe where the Creator governs. Each one of us has to reveal this on his own. I exist in the concealment of the only state created by the Creator. I am already in it. As soon as the Creator desired to create it, it emerged immediately. I simply reveal this state, which is already prepared. I don’t do anything with the state itself – with the Light and Kli which exist in it. I only work in order to reveal it for myself. We are talking about degrees, or states of our revelation. These are the degrees of the worlds. We don’t build anything new. We just develop an inner perception of the reality that exists from the start. Therefore, everything is revealed in regard to me. New states arise in me from the existing Nature. The Light that returns one to the Source is an instrument that you hold in your hands. Whenever you find yourself helpless, It will complete what you have started and open up the secret door in the wall for you. The holidays are special because there is a special influence of Light in our reality, giving us additional support from Above. Shame is the lever for coming out of your current state, upwards. When I agree with the Creator’s actions onto me, then I reveal the fulfillment of love within the abyss of my desires. A question I received: Why does one person have all the luck in his life and another doesn’t? Can people change their fate? My Answer: According to the Law of Roots and Branches, all the elements in each world are alike and all the connections between the elements are the same. This means that the network of forces in each world is the same and all the events happening in each world are the same. There is nothing in our world that just happens for no apparent reason. If I begin to realize this unbreakable link, that everything is predetermined, then I understand that there are no accidents, but there is luck (Mazal). The Hebrew word Mazal comes from the word “trickle or drip” (Nozel). To drip means to come down in drops, one after another and that a gap or space exists between the drops. There is a special system in the World of Atzilut where the Upper Light flows down in drops through the special spiritual Partzufim. We are able to change our fate if we know how to enter between these drops of luck that are descending upon us. Despite predetermination from above, the Law of Roots and Branches allows me to influence my “luck,” though not on the plane of this world but on a higher plane, so my “luck” comes down to me clothed in a different form. That is what we study in the science of Kabbalah – what it means to have “a different form,” when and how. If I know how to change my luck and how to enter into the space that is created for me, and if I correctly participate in it, then I become a human being. I complement the Creator’s actions that He has created for me, and by doing this I become independent. The study of the Law of Roots and Branches helps us to join and become a partner in Upper Governance. It is then that a person enters into a partnership with the Creator. You already exist inside an infinite, complete, final and corrected state. Everything already exists. However, this state is concealed from you, and can be revealed to you to the extent you become similar to it, or reveal that you are similar to it. In the initial state of creation – the World of Infinity, the creation felt the agony of hell: the shame of receiving from the Creator. If this sensation was revealed to us now, we would experience it 620 times greater. This is why at every stage of our development, there is a finely measured degree of concealment. This is in order for us to discover the correct desires and qualities within us, for our future states. According to my ability to bestow, I start feeling the Creator’s bestowal. The two of us are then equal due to our bestowal and love. This is how one reaches the end of the path. A question I received: I often try to justify the Creator, but still continue to feel very bad. Is this considered justifying the Creator? My Answer: No. How is this even possible!? Someone beats you up and you go and kiss his hands, or you cry bitterly, but your mouth is saying: “I’m enjoying this! These are tears of happiness!” That’s simply impossible! Question: If Eve’s condemnation following the sin is that man will rule over her, what can we do in this world to adjust to this condemnation without conflict or suffering? My Answer: There is no submission. Instead, there is the proper realization of common natural qualities. This is why you have to study Kabbalah, realize it together and aspire together to reach the third one – the Creator. Question: What if a man does not know if he wants to stay married, and a lot of issues from the past come up? What if the woman does not want to divorce and neither of them are in a religion? My Answer: Go to your common goal which is the Creator, instead of both of you retreating into your shell. Only then will everything turn out all right. Question: I partially understand that marriage is part of a man’s correction. However, I have very few corporeal merits that would make me remotely appealing to the opposite gender. I am poor, bad with money management, own no house, have no car, and am only concerned with one thing, which is Kabbalah. Should I divert time from my studies and work in the group to make myself more corporeally fit for marriage? Do I really even need to be married? My Answer: Continue doing what your heart aspires to, since this is the reason man was brought into this world. All the rest will follow and the group will help you find your match. All our advancement is determined by the sensitivity of our desire, or the amount of qualities it discerns. Increasing one’s desire does not mean making it bigger. The development of the desire is qualitative, not quantitative. When we prepare for entering the spiritual world, we have to focus on the quantity of the impressions we have accumulated, because their quantity determines the quality of our desire. The most important thing about the desire isn’t its size, but its direction, sensitivity, and focus on the goal, on “what do I consider the most important thing?” Therefore, our task is to focus on making our desire correct, and when it becomes correct, the fulfillment will immediately be revealed inside it. 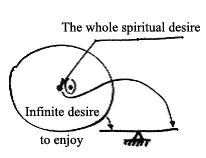 So, the most important thing is to acquire the full degree of desire, to accumulate the appetite for the feast that the Creator has prepared for us. There is a royal feast waiting for us, and a world full of goodness. As soon as our desire will match the fulfillment, we will immediately feel the fulfillment inside us. It already fills us, but it is concealed and operates inside the Kli.